Creative Masonry & Chimney has well over 20 years of experience in fireplace damper repair, installation, and replacement. 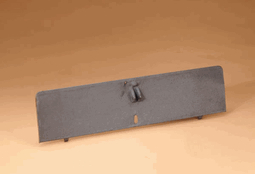 We sell and install replacement dampers and parts for just about any fireplace. Our fireplace repair experts can resolve any problems you may have. Visit us today to purchase your hearth accessories or discuss any projects you may have. These are the standard installation for most fireplaces. They are usually made of cast iron and are installed at the time the fireplace is built. There are generally 3 main parts to make a complete unit. The body, plate, and handle. With this type of unit installed it is likely you will feel cold air down drafting into the fireplace when it is not being used, even when “closed”. These dampers usually have a few different aliases. 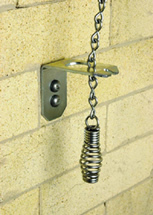 Top Mount, Energy Saving, Pop Top or replacement dampers just to name a few. 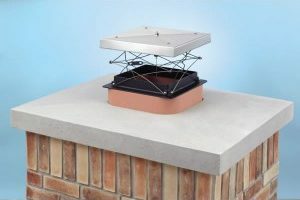 These units generally mount to the top of the chimney and have a handle mounted in the fireplace for easy operation. Most Top Mount fireplace dampers have a gasket and are just about airtight, this stops cold air and animals coming down your chimney, as well as not letting the heat flow up and out of your chimney. This style is also used when a damper plate is missing or the body of the original has been modified or damaged. Most Top Mount fireplace dampers have a gasket and are just about airtight, stopping cold air and animals from coming down your chimney as well as restricting heat flow out of your chimney. This style is also used when a damper plate is missing or the body of the original has been modified or damaged. This type of damper is generally used with wood stoves and mounts inside the black stove pipe, before the thimble. Available in – 6”, 7” 8” sizes. The damper plate is also referred to as the door. This is a removable section which the handle attaches to. 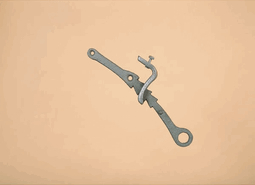 This part is replaceable if you know the manufacturer of the traditional damper. Most of the time parts are NOT interchangeable. We carry a full selection of doors/plates. These are the two most common type of replacement damper handles. 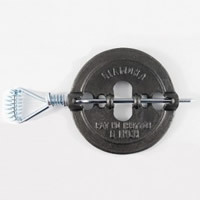 Handles are in stock ready for pick up or shipping.